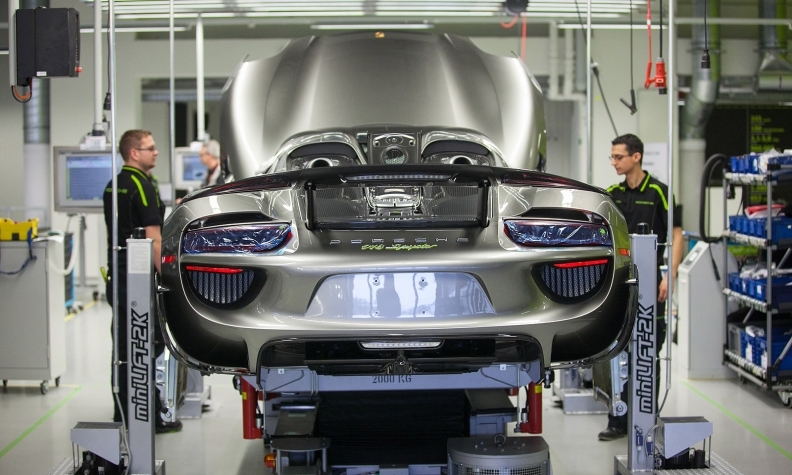 Employees assemble Porsche's 918 Spyder E-hybrid car along the production line at the company's factory in Stuttgart, Germany, this week. 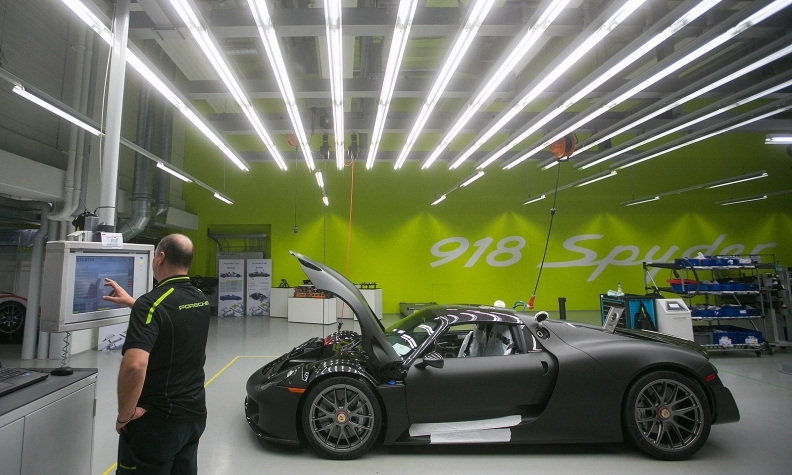 FRANKFURT (Bloomberg) -- Porsche AG may expand its growing lineup with a battery-powered vehicle to cater to demand for cleaner luxury vehicles and counter the rise of Tesla Motors Inc.
A Porsche 918 Spyder E-hybrid undergoes testing under strip lights on the production line at Porsche's plant in Stuttgart, Germany, on Tuesday. The company is nearing a decision to add a seventh model to its lineup. For an electric car, which would help the brand comply with tightening environmental regulations, Porsche is targeting a range of more 310 miles before needing to recharge, which shouldn’t take longer than a normal stop on a motorway, he said. Profits from Porsche and Audi are vital to finance the global expansion plan of parent Volkswagen to remove Toyota Motor Corp. from the industry's top spot by 2018. Porsche forecast revenue will continue to rise this year on the back of higher sales volumes. Rising costs for developing new models and expanding manufacturing capacity are poised to weigh on earnings. "Repeating the result at the level of the previous year represents an ambitious aim," Porsche Chief Financial Officer Lutz Meschke said. "Nevertheless, we shall adhere to our strategic returns target of 15 percent.